Three previously unknown submarine arc stratovolcanoes have been identified at the S end of the Kermadec Ridge: Rumble V (36.140°S, 178.195°E, summit 700 m below sea level); Tangaroa (36.318°S, 178.031°E, summit 1,350 m below sea level); and Clark (36.423°S, 177.845°E, summit 1,150 m below sea level) (figure 1). All three have basal diameters of 16-18 km and rise from the seafloor at ~2,300 m depth. The first evidence of the volcanoes was from GLORIA side-scan mapping of the southern Havre Trough-Kermadec Ridge region in 1988 (Wright, 1990). Later investigations, including a photographic and rock-dredge study during the 3-week Rapuhia cruise (early 1992), confirmed previous interpretations. Side-scan and photographic data show a complex terrain of lava flows and talus fans on the flanks of all three volcanoes, with the most pristine-looking morphology at Rumble V. During the 1992 cruise, gas bubbles were detected acoustically, rising from the crests of Rumble III, IV, and V. No gas bubbling was evident from Tangaroa or Clark. 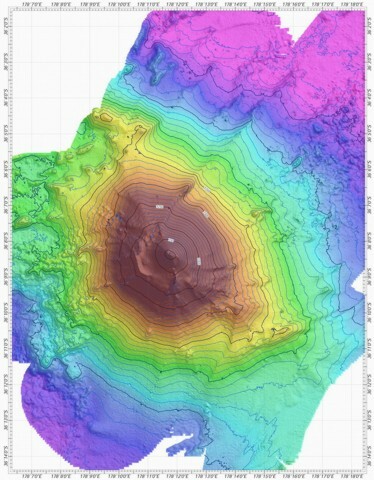 Bathymetric surveys indicated that the summits of the shallowest volcanoes, Rumble III and IV, were at ~140 and 450 m, respectively, below the sea surface. Figure 1. Sketch map of New Zealand's North Island and the southern Kermadec Ridge area, with locations of young volcanoes. Courtesy of Ian Wright. Reference. Wright, I.C., 1990, Bay of Plenty-Southern Havre Trough physiography, 1:400,000: New Zealand Oceanographic Institute Chart, Miscellaneous Series no. 68. Information Contacts: I. Wright, New Zealand Oceanographic Institute, National Institute of Water and Atmospheric Research, Wellington. The Global Volcanism Program has no Weekly Reports available for Rumble V.
The Global Volcanism Program has no synonyms or subfeatures listed for Rumble V.
A previously unknown submarine volcano, Rumble V was discovered in 1992 at the southernmost of a group of seamounts on the southern Kermadec Ridge, known as the Rumbles. It rises more than 2,000 m to nearly 400 m below the sea surface and shows a pristine morphology. Andesitic and basaltic-andesite rocks have been dredged from Rumble V, which lies 17 km ESE of Rumble IV. A large plume of gas bubbles was acoustically detected rising from the summit of Rumble V in 1992, and subsequent expeditions detected evidence of vigorous hydrothermal activity. de Ronde, C E J, Baker E T, Massoth G J, Lupton J E, Wright I C, Feely R A, Greene R R, 2001. Intra-oceanic subduction-related hydrothermal venting, Kermadec volcanic arc, New Zealand. Earth Planet Sci Lett, 193: 359-369. Massoth G J, de Ronde C E J, Lupton J E, Feely R A, Baker E T, Lebon G T, Maenner S M, 2003. Chemically rich and diverse submarine hydrothermal plumes of the southern Kermadec volcanic arc (New Zealand). Geol Soc London Spec Pub, 219: 119-139. NIWA/NOAA Vents Program, 2005. New Zealand American submarine ring of fire 2005 Kermadec arc submarine volcanoes. New Zeal Nat Inst Water Atmosph Res/NOAA Vents Program final cruise report (http://www.oceanexplorer.noaa.gov/explorations/05fire/logs/leg2_summary/media/srof05_cruisereport_final.pdf). The Global Volcanism Program is not aware of any Holocene eruptions from Rumble V. If this volcano has had large eruptions (VEI >= 4) prior to 10,000 years ago, information might be found on the Rumble V page in the LaMEVE (Large Magnitude Explosive Volcanic Eruptions) database, a part of the Volcano Global Risk Identification and Analysis Project (VOGRIPA). There is no Deformation History data available for Rumble V.
There is no Emissions History data available for Rumble V.
A bathymetric map view shows Rumble V submarine volcano at the southern end of the South Kermadec volcano group. A large plume of gas bubbles was acoustically detected rising from the summit of Rumble V in 1992. Rumble V volcano, the southernmost of a group of seamounts on the southern Kermadec Ridge, known as the Rumbles, rises more than 2000 m to about 400 m below the sea surface. Courtesy of Ian Wright (National Institute of Water and Atmospheric Research (NIWA), Wellington, New Zealand). There are no samples for Rumble V in the Smithsonian's NMNH Department of Mineral Sciences Rock and Ore collection. IRIS seismic stations/networks Incorporated Research Institutions for Seismology (IRIS) Data Services map showing the location of seismic stations from all available networks (permanent or temporary) within a radius of 0.18° (about 20 km at mid-latitudes) from the given location of Rumble V. Users can customize a variety of filters and options in the left panel. Note that if there are no stations are known the map will default to show the entire world with a "No data matched request" error notice. Large Eruptions of Rumble V Information about large Quaternary eruptions (VEI >= 4) is cataloged in the Large Magnitude Explosive Volcanic Eruptions (LaMEVE) database of the Volcano Global Risk Identification and Analysis Project (VOGRIPA).